Is Edinburgh Hogmanay The Best Place for New Year’s Eve in Europe? Aye, it freaking is! 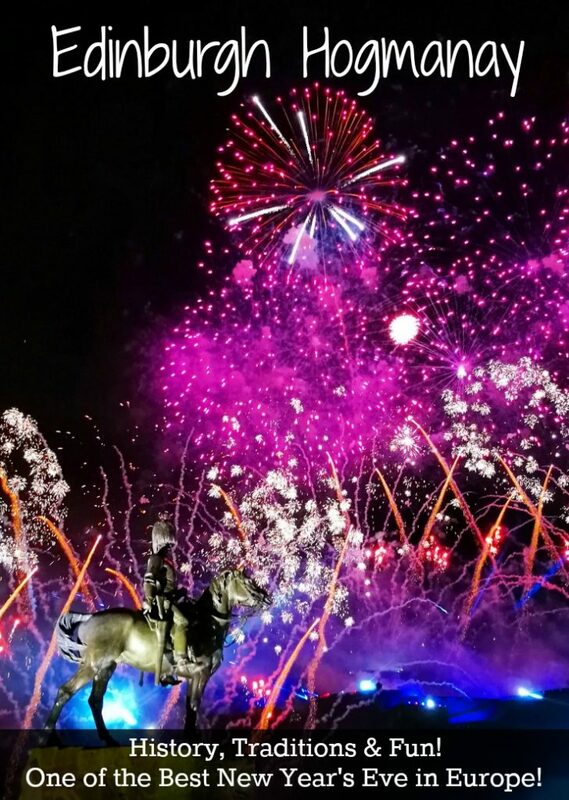 Edinburgh Hogmanay is the best place for New Years in Europe, not only because of the party and the fireworks but due to its history and Scottish traditions! A lot of people questioned us why travel to Edinburgh for New Year, if we could do it in Brazil, with warm weather and by the beach. 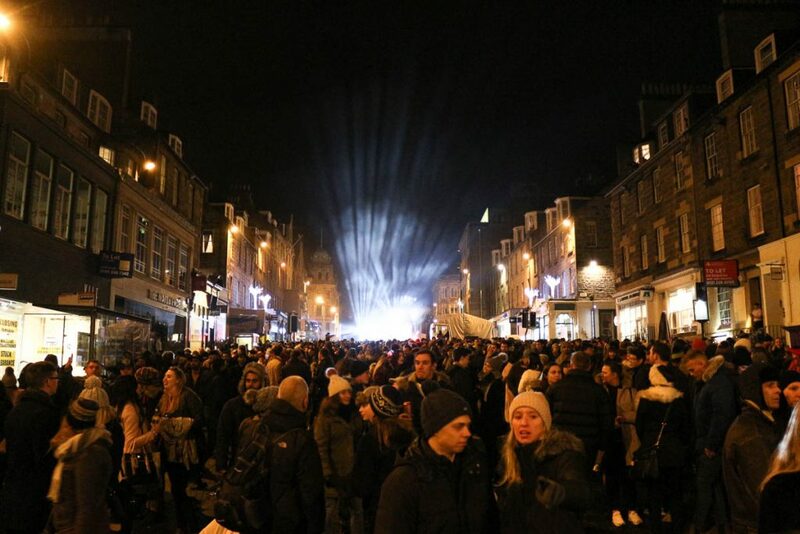 The answer is simple: Edinburgh Hogmanay is an experience everybody should have at least once in a lifetime. We have heard so many good stories about Hogmanay celebration that we couldn’t wait longer, so 2017 arrived with freezing temperatures, great parties and a lot of fire! If you are planning to celebrate Hogmanay in Edinburgh or if you’re searching for an epic new year’s party, you must read this post carefully. Travel tips, our experience and some recommendations to plan the best new year’s in Europe: the Hogmanay in Edinburgh. What does Hogmanay mean? Why do they celebrate the new year is a different way? And why it happens in Edinburgh? So many questions and so many parties in such a tiny country! Are there any “strange” Hogmanay tradition? Neighbours traditionally visit each other houses, bringing along cakes, shortbread and of course, whiskey. So if you have a Scottish friend don’t forget to visit them before the party starts. Hogmanay doesn’t exist without fire and bonfires. Because of the Viking and pagan origins, fire is part of the Hogmanay New Year’s celebration and reminds the ancient beliefs of purification. When the fireworks strike the sky you will see people holding hands, singing a song and being merry. Probably they are singing Robert Burns’ Poem Auld Lang Syne. Of course, there are other Hogmanay traditions, but I’m not writing all them here. Let’s leave some mystery for your trip to Edinburgh. Hogmanay is more than one night party! This is a most important information: Hogmanay in Edinburgh is a marathon of events, parties, shows, concerts, bars and music. And an army of happy people taking over the historical streets of Edinburgh. Hogmanay celebration starts way before 31st of December. From Christmas to 2nd of January there are events happening across the city, with the grand finale on 30th and 31st with the Torchlight Procession and the famous Edinburgh Street Party. 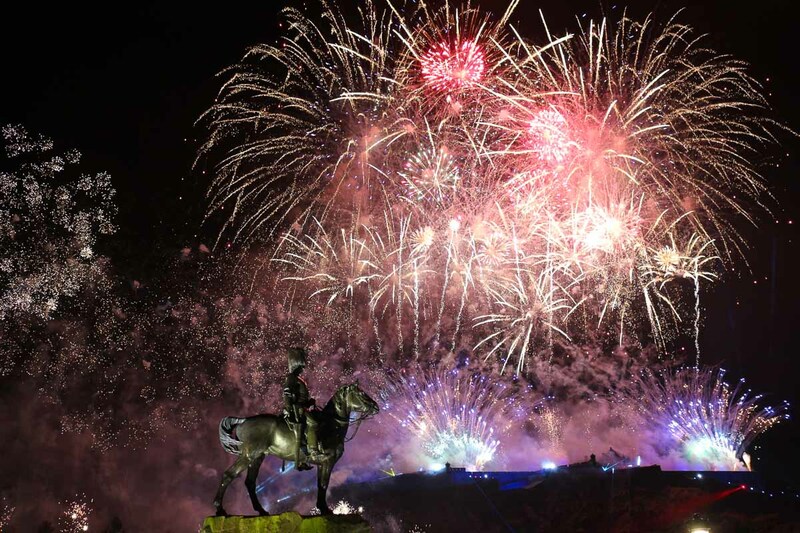 Hogmanay is a world famous festival and you need to organize your days and nights to get the most of it. Hogmanay is intense in all meanings, from cultural events to pubs, and endless Scottish songs! What can’t you miss during the Hogmanay in Edinburgh? When you check the Edinburgh Hogmanay website the amount of activities happening in the city is overwhelming. 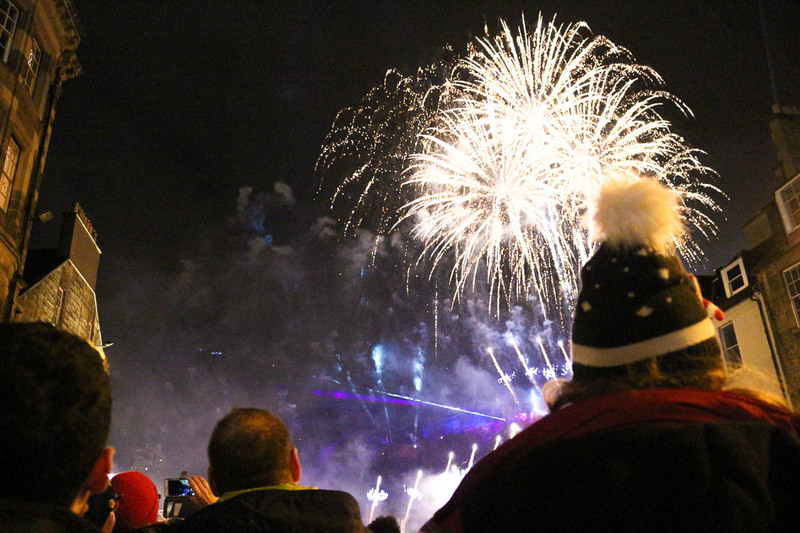 To make your life easier, here is a list of things to do during Hogmanay, events that you can’t miss during your Edinburgh Hogmanay trip. Thousands of people lined up under the mist and cold. I remember looking around and I could see people from everywhere. I listened to the heavy Scottish accent from one side, Spanish from another, behind us was a Japanese couple couldn’t stop giggling of excitement. Until that moment I was handling my emotions as an adult woman, but when the fire lighted up my torch and the procession started I almost cried. 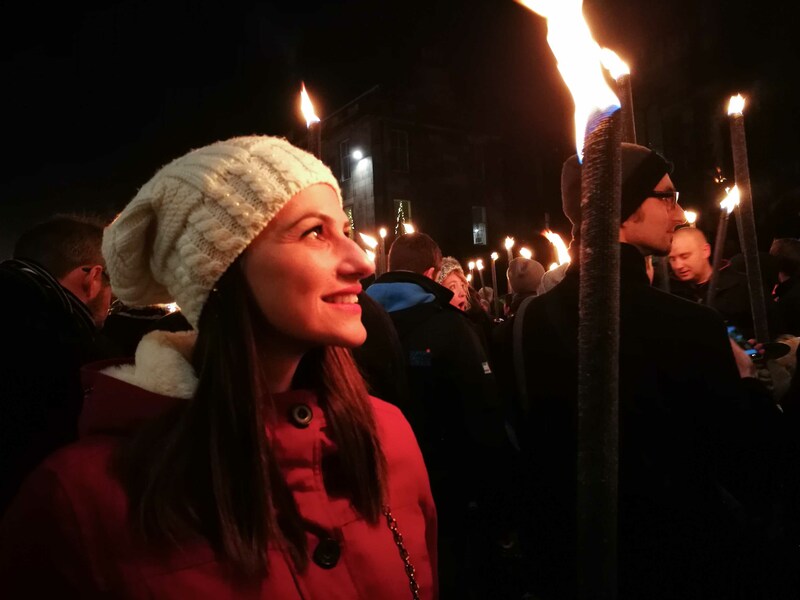 I couldn’t believe I was in the middle of the Torch Light Procession, celebrating Hogmanay in Edinburgh, Scotland! I was part of one of the most beautiful, historical and definitely the best place for new year in Europe. If you are travelling to Edinburgh Hogmanay you MUST take part of the procession! It’s the only place in the world where you can see kids, families, foreigners and Vikings side by side, in the middle of a medieval town. It’s an experience like no other. The procession is huge! You must buy your ticket way in advance, collect your torch and go to the assembling point at least 2 hours before it the starts. Otherwise, you only be able to watch it from far away and believe me, the real fun is to be in the middle of it! In Edinburgh Hogmanay you can party until you drop. Local bands, international singers and classic music. There are events for tastes, ages and almost every day, but definitely the special nights are the Hogmanay Concerts that happen on 30th and 31st of December at the Princess Garden. The shows are sold out very quickly, be smart and book your tickets in advance. The Candlelit Concert is another famous event during Hogmanay celebration, the classical presentation happens at the St. Giles’ Cathedral and you need a special ticket to attend it. If you like arts, Scot:Lands is another event that you can’t miss. On January 1st, different venues across Edinburgh’s Old Town are displaying music, arts and theatre. You can walk around, exploring your imagination with Scotland’s most creative artists and musicians. Follow the steps of your Scottish friends and immerse yourself in the traditional music and dance. At first sight it doesn’t seem an easy dance to learn, but after a few beers you will discover that Ceilidh is all about experiencing the traditions, have a good laugh and make friends. During the Hogmanay celebration, the official Ceilidh event happens in the Old Town, but if you miss it, or if the time doesn’t suit your new year’s celebration schedule, don’t worry. There are plenty of Ceilidh dance happening around town, and if a man dressed in a kilt invite you to dance, don’t dare to say no! I know, we are talking about the best place for the new year in Europe, why should I tell you to visit the Christmas Market?! 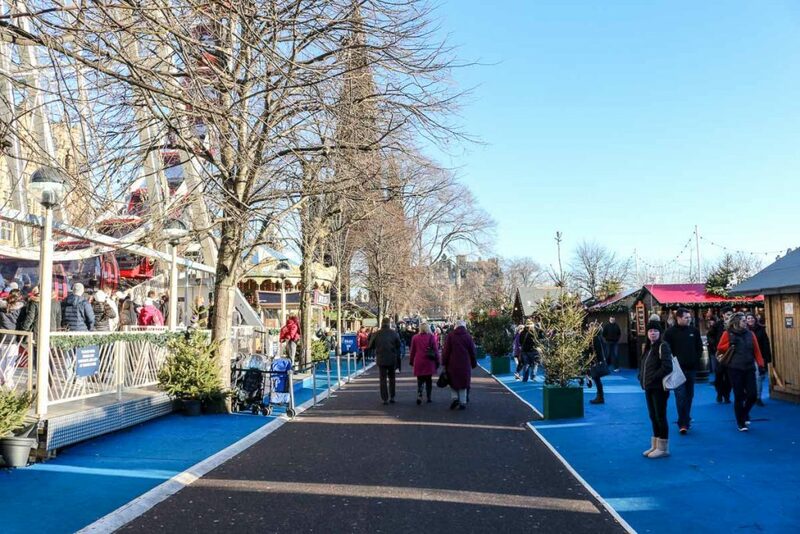 The fact is that Edinburgh Christmas Market happens throughout the whole month of December and the food there is perfect for hangovers or a quick bite between concerts. Mulled wine, delicious hot dogs, waffles and salmon sandwiches… At the market you can fill your belly, buy souvenirs for the family and have fun on the Ferris Wheel or on the carousel! It’s holiday season, have fun! Edinburgh Hogmanay Street Party is serious business! Get your coat, gloves and hat, be ready to face the cold weather, the rain [it’s Scotland so it will probably rain] and dance your socks off. Don’t be late, the Hogmanay Street Party starts early, by 9PM the Princess Street is already packed and the party is on full swing. 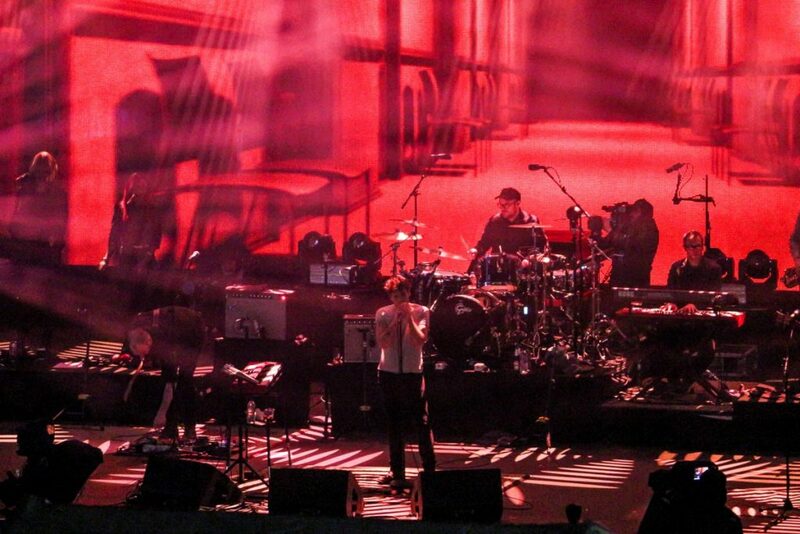 There are several stages, playing all types of music. My suggestion is to stay in an open area where you can see the Edinburgh Castle, as in every hour there are fireworks. Even been packed with people [tourists and locals] we felt super safe, everything was well organized, the security staff and the police officers were helpful and polite. Another surprising thing about Edinburgh Hogmanay is that you can bring your own booze. Yeah, that’s true! As long as your beer or wine are in plastic bottles and you are not carrying tons of it, you can bring them inside Edinburgh Street Party premises. Be aware that the Hogmanay Street Party entrance gates close at 11PM. Buy your tickets in advance and arrive early. Don’t be a fool, I’m sure you don’t want to miss the best new year’s eve in Europe! I don’t need to tell you that you must be at Edinburgh’s Old Town before midnight. But what I do have to warn you is that the firework show that happens over the city’s castle is majestic. Have your camera ready, hug your friends, family and even some strangers. Make a wish and welcome the new year in the best way it’s possible: with positive energy and an outstanding spectacle. Doesn’t matter if you like loud music and dancing, or a quiet place to drink and chat with friends. In Edinburgh you gonna find not one, but several pubs to have fun. The whisky and the beer culture is part of their life and during Hogmanay the pubs are open almost 24 hours. Because is never too late or never too soon to have a drink. If you like a good party [like us] you can’t miss the Kiwi and Aussie New Year’s celebrations. In some pubs you have the Aussie new year’s countdown with dj spinning great tunes from 9 AM. The party goes on until the Scottish new year arrives. Scottish people have the perfect hangover cure: freezing river water, fancy dress parade and maybe a flu on the next day! Rob had the guts to join the Loony Dook, I decided to stay dry taking photos of the epic moment. 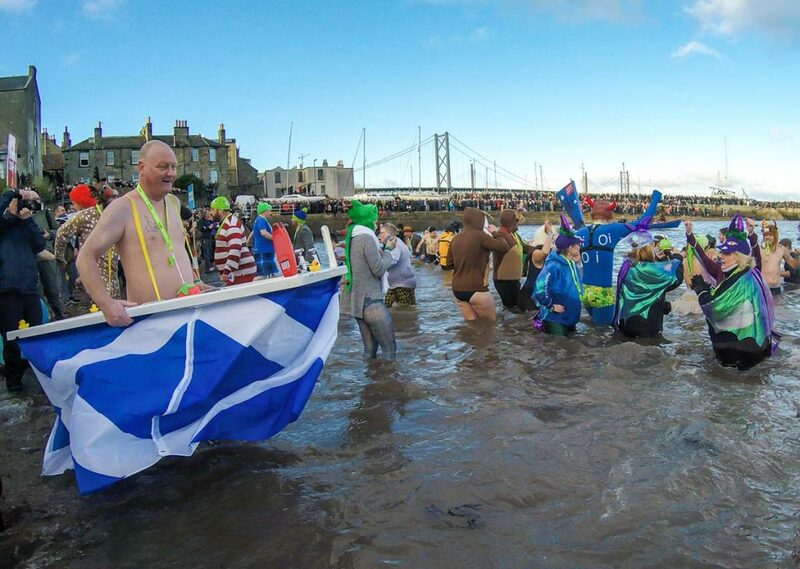 The Loony Dook is a 30 years old tradition where thousand of “Dookers” or “Loonies” head to South Queensferry to swimming in the freezing River Forth. Fancy dress is a must and a set of dry clothes for after the cold dip is essential. The parade is so much fun, that even if you don’t feel like swimming, it’s worth to go and watch the event. If you are brave [or crazy] enough to join the Loony Dook, keep in mind that you need to book your ticket in advance as they don’t sell tickets on the day of the parade. 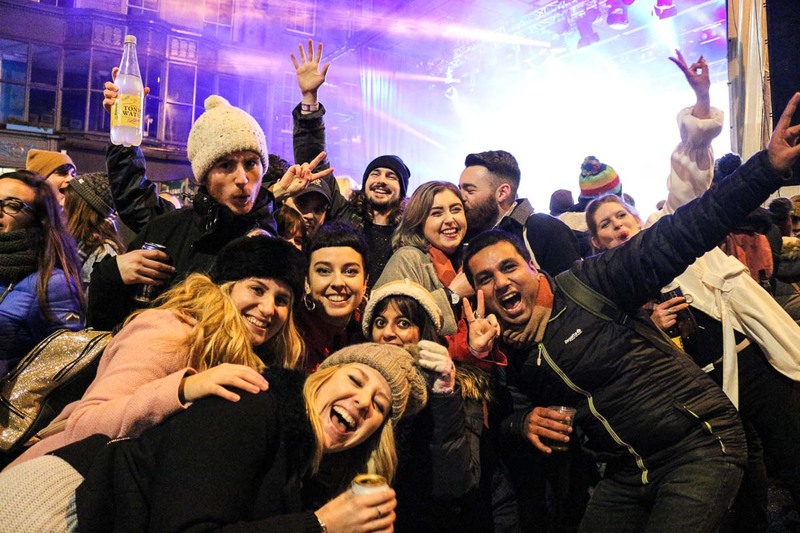 Now that you know what Edinburgh Hogmanay means, why it’s the best new year in Europe, and how much fun you can have, it’s time for the hardest part: planning! How to organise a trip to Edinburgh Hogmanay? Now you already know that Edinburgh Hogmanay has several events and most of them tend to be sold out quickly. And that thousands of people travel to Scotland to experience the Hogmanay celebration. That means planning a trip to Edinburgh Hogmanay by yourself is not easy and you need to start doing it soon. As soon as they announce the dates and tickets. We organise 99% of our travels by ourselves, but Edinburgh Hogmanay experience was one of the exceptions. Even with all our travel planning skills, I didn’t want to handle all the bookings and buy all the tickets in advance. So we decided to join a Hogmanay tour and no regrets! There are plenty of companies offering Hogmanay tour experiences, Haggis Adventures is the one we choose and we had 5 incredible days. We didn’t have to worried about anything, from the moment we arrived all went smooth and flawless. We loved on our Hogmanay 5 days package because of the amazing extra activities we had, and the fact that when we arrived in hostel we received all our tickets, wristbands and vouchers. 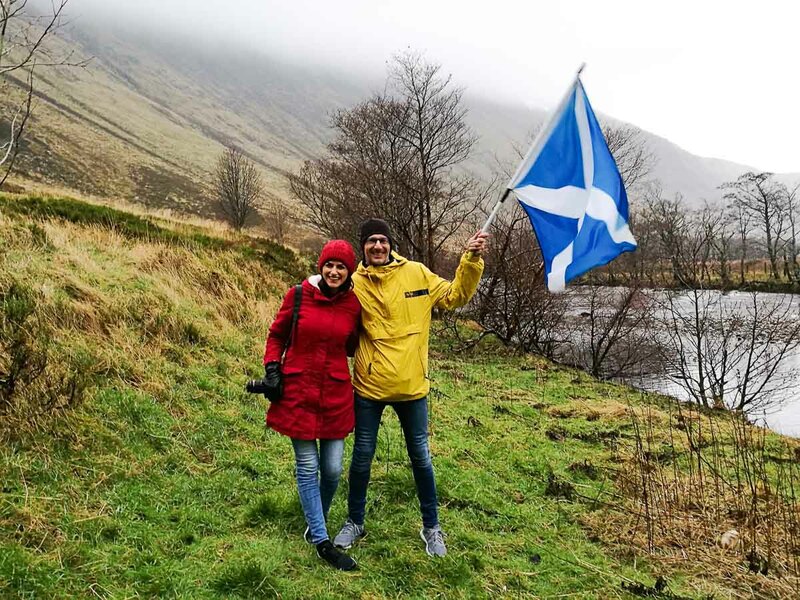 Apart from the Hogmanay Street Party, the Torchlight Procession and the Loony Dook, the Haggis Adventures took us on a day trip to the Scottish Highlands. We drove by lovely villages and breathtaking landscapes. Visited the stunning Kelpies, walked to the top of the Abbey Craig Hill to have a close look at William Wallace Monument. Got enchanted by the green forest at The Hermitage Park in Dunkeld, visited a tiny fisherman village, and sang with our tour mates some of the best Scottish songs [including AC/DC]. To be honest, I was a bit worried when we booked the Haggis Adventures Hogmanay 5 days tour. 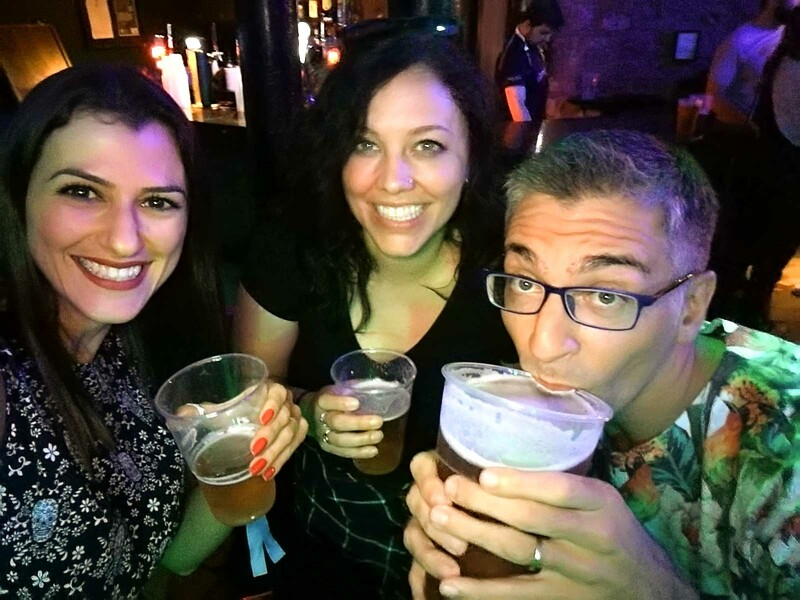 I was afraid that it would be too hectic, too much party and drink… I do love a great night out, but I now on my 30’s the pace of partying is getting slower and my hangover stronger. But surprising, you can do the tour and the activities on your own pace. If you fancy going out with some fellows from the group: good! If you want to stay alone it’s fine too! You have all the tickets, you receive the timetables and the information, so you can organize your schedule and activities on the way that suits you! During the Hogmanay, Haggis Adventures partnered with some pubs so we had discounts on drinks and even private parties. Sweet! Talking about party, we had our own Ceilidh Night, with a live band and our guide teaching the traditional dance. Did I mentioned we went on a night walking tour in Edinburgh?! Oh boy, we did so many things and had so much fun! Another good thing about booking a Hogmanay Tour is that you don’t need to worry about accommodation. Hotels during Edinburgh Hogmanay are quite expensive, middle range and budget hotels get fully book super fast. We talked with Haggis Adventures and they booked everything for us. We stayed in a shared 6 mixed bed dorm and met two great couples. Of course, you can book accommodation and organise all the Hogmanay experience all by yourself, but I honestly don’t think it’s worth the hassle. Leave the hard work for those who have experience on it! It will be cold and rainy, prepare yourself! Coats, umbrella, rain ponchos… Be ready for the fun with dry or wet weather. Don’t panic if during the Torchlight Procession your arms and jacket get covered of wax. It happens with everybody, the wax smells good and you can clean your clothes easily. Brown paper and iron, that’s what you will need to get rid of the wax, Google it! Reserve at least two more days to explore the city. The amount of places to visit and things to do in Edinburgh will surprise you. But don’t forget that 1st and 2nd of January are bank holiday in Scotland, some attractions might be closed. Most of the Edinburgh Hogmanay tours don’t include flights, so you will need to buy the tickets by yourself. Do it as soon as you can, so you can get the best prices. To search and book the best flights to Edinburgh have a look at Kiwi.com and Skyscanner. Safestay Edinburgh – a hostel with shared and private rooms, super organized, clean, helpful staff and a bar/restaurant that serves great beers and delicious food. We stayed there during the Hogmanay and recommend it! Great atmosphere and friendly prices! Motel One Edinburgh-Princess – you can’t find a hotel with better location, good price and superb reviews. If you want comfort and privacy without spending a fortune, the Motel One might be the best choice. 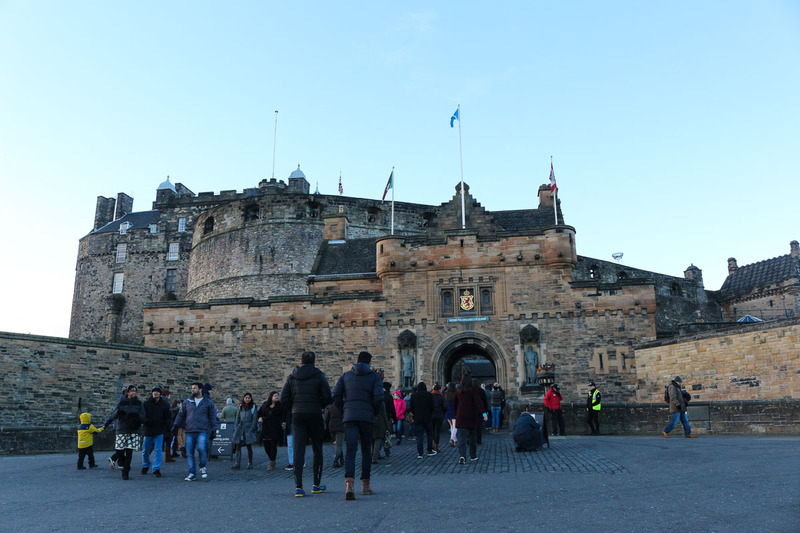 Five minutes from Waverley Station, you can reach all the attractions, the Royal Mile and Edinburgh Castle by foot. The Balmoral Hotel – if money it’s not an issue treat yourself at one of the best 5 stars hotels in Edinburgh. The Balmoral is famous for its flawless service and Michelin-starred restaurant. If none of these hotels suggestions shake your boat, keep searching. 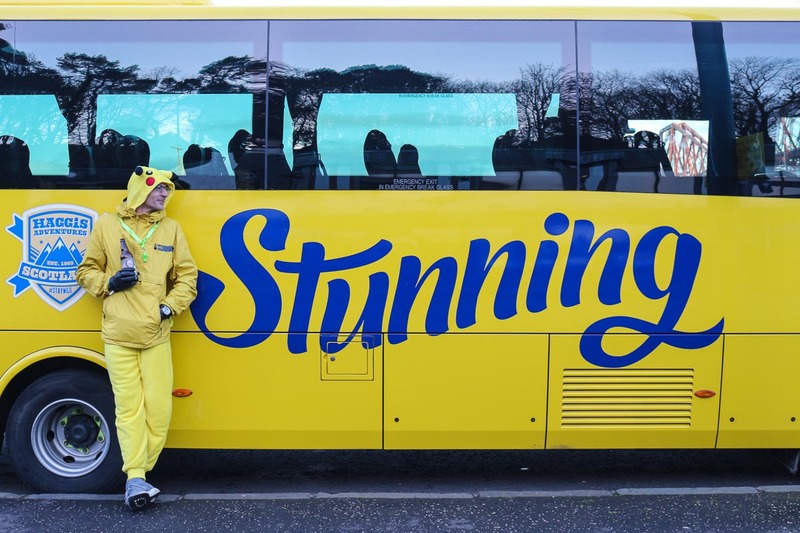 To find the best accommodation in Edinburgh on use Booking.com or Agoda! Want to have a home away from home experience? So you can rent a self catered cottage in Edinburgh or nearby the city, it’s perfect for a family or group of friends. Are you ready for the best New Year’s Eve in Europe? Hogmanay Edinburg is waiting for you! Do you have doubts about how to plan a trip to Edinburgh? Or how to book the best Hogmanay tour? Leave us a message. Happy New Year!! I’ve never heard of Hogmanay before but it sounds exciting. I like how there are a range of activities to do and that it’s for several days. Hogmanay is a week celebration with activities fro all type of people and ages. Love it! I definitely think it’s worth it to experience events like this around the world. I mean, why not!? I’d love to try it out at least once. It looks like a crazy fun party. Totally agree Laura, it’s an experience of a lifetime! I’ve been wanting to do Hagmanay for years! It looks like a fantastic way to ring in the New Year. I’m married to a Scot, so I know they know how to do new year’s eve properly! However, he’s from Glasgow, so he might want to disagree about Edinburgh being the best place…..
I’ve been in Glasgow and enjoy it a lot, but Edinburgh has a special place in my heart! One of the best New Year’s celebration we’ve had so far! Photos of Scotland always take my breath away. These Hogmanay celebrations look like so much fun! What a great time to visit. It makes the holiday season even more festive when you visit such a lively city. Sign me up for the Loony Dook for sure! OMG Jackie, would you swimming on that cold water?! Kudos, you are a tough girl! Love Edinburgh! It seems like it always has a party, festival, or event going where people hit the streets and celebrate/party, from The Fringe to Hogmanay. The Scots love to drink and party, so its no surprise that their New Years lasts not one night, but a whole week! What a way to ring in the new year! You know Scotland well! Drinks and parties that last for weeks, the best way to start the new year! Looks like you guys had a blast! I had never considered Edinburgh for new years celebrations but this seems to be quite the party. Not sure about that post-party freezing water thought! If you like a good party, go to Edinburgh. Even skipping the cold swimming it’s great fun! 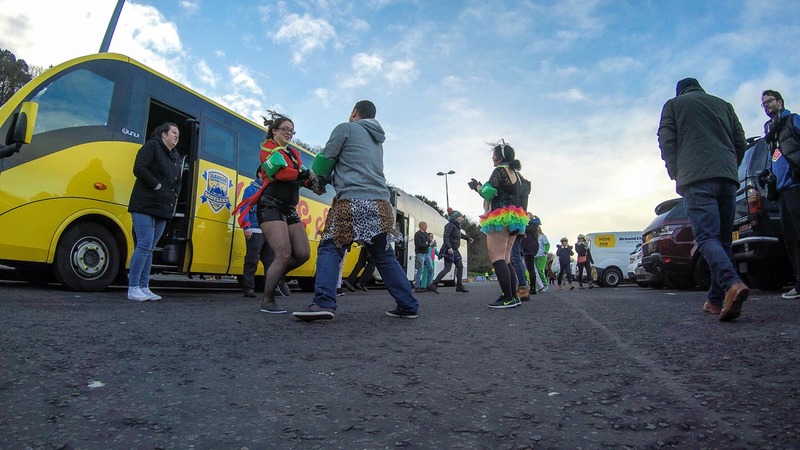 How interesting to read about the Edinburgh Hogmanay festival. I’ve never heard of it and it sounds like so much fun. It definitely sounds like the way to get the most out of the experience is to book a tour. Thanks for sharing your experience. I totally recommend a tour during Hogmanay, it makes your life so much easy to book all the tickets, accommodation. Plus you can share the moment with people from all around the world. Now more than ever I need to visit Scotland. This Hogmanay tradition sounds awesome. I love the idea of neighbours visiting each other and bringing cakes, shortbread and whisky. Plus fireworks and bonfires ah yesss. Go for it! Scotland is a stunning country, and during Hogmanay it becomes on of the happiest places on earth! We did Hogmanay in 2014 and it was absolutely nuts. There were so many people, at one point I could jump up and get stuck between the dense crowd. It was a lot of fun though but we missed the torch light procession. This year was packed, but not overcrowded, we could dance and move around. You missed the Torchlight Parade?! SO you need to go back for one more Hogmanay! And yes, the festival brings some color and life to the city! I’ve been looking at going to Hogmanay from London but with accommodation/train tickets and the street party tickets its so expensive… any suggestions? If you book well in advance you can get good deals. If you don’t wanna to do all the research you can contact Haggis Adventures, they took good care of us. I’ve done Hogmanay twice and would definitely recommend it! I went with Haggis the first year for a 4 day package which was great and then went with Stoke Travel last year as they had a 24 hour package so I didn’t need to take time off work. If you are coming from London I’d recommend Stoke and it includes both your train ticket and street party tickets and a lot more, would recommend!